PowerShell is a wonderful command line equivalent of the Windows Explorer, taskmanager, or the DOS box. Instead of drilling down through countless GUI menus you can type a few Verb-Noun commands and get the job done quicker and with more precision. What’s new in PowerShell 3.0? In a nutshell v 3.0 provides hundreds of extra cmdlets. There is also a neat Auto-Complete prompt to help selecting commands. However, the general improvements compared to v 2.0 are most useful for developers. The precice benefits of using PowerShell in Windows 8, rather than DOS or VBScript, depends on your background. However, for the rest of this page, I am assuming you have little or no experience of PowerShell. 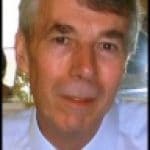 To newbies I would also like to say this, if you ever had the desire to be a computer programmer, then thanks to Microsoft’s PowerShell you will soon be writing scripts to interrogate the operating system. 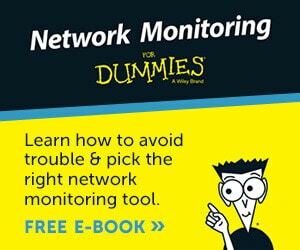 As a result, you will not only be able to get data more efficiently, but also it will make tuning your computer configuration more pleasurable. One by-product of PowerShell is that pure DOS commands are virtually redundant, even better, if you do need any of those old DOS commands, then they work in the PowerShell interface, thus you have nothing to lose by abandoning cmd.exe and trying PowerShell ISE with its graphical interface. My examples underplay PowerShell’s abilities as a scripting language, this is because I don’t want to frighten people from learning PowerShell, just because they have no knowledge scripting languages such as C+ or VBScript. My message is this: ‘it’s ridiculously easy to get started, but remember, it’s hard work to become truly expert in PowerShell’. Launching PowerShell in Microsoft’s Windows 8 is a trivial task; because unlike Vista, the .NET Framework and PowerShell binaries are already installed. From the New UI, press the ‘p’ key. You should see all the programs and Apps beginning with ‘p’. 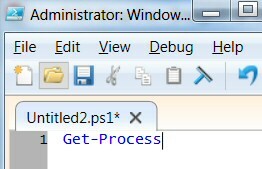 I recommend right-clicking ‘Windows PowerShell ISE’, you should see ‘Pin’ at the bottom right of the sceen. Pinning means that PowerShell will have a permenant tile on the Metro-style UI. I like to drag my PowerShell tile to the left of the screen so that it’s easier to find next time. The first point to recognise with PowerShell is the simplicity of the cmdlet. At the heart of the script is always a Verb-Noun pairing. Note: As you become more experienced with PowerShell you can cut a few corners, for example Where-Object can be coded as plain Where. What’s New In Windows 8’s PowerShell 3.0? The Auto-Complete feature is useful for checking commands. As you begin to type a cmdlet you see a pick list of likely nouns to append to your verb. Whereas PowerShell v 2.0 brought remoting, PowerShell v 3.0 brings new cmdlets. One example of the new cmdlets, PowerShell 3.0 employs AppX, which is a new method for deploying applications in Windows 8. 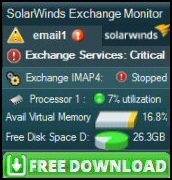 Lookout for Microsoft’s ‘Jupiter’ model, it’s designed along the same lines as Silverlight XAP. Even experienced PowerShell users call for Get-Help when they need to research a new cmdlet. Note 2: Actually, you don’t need ‘Get-‘, plain ‘Help Verb-Noun’ works because ‘Get’ is the default verb. Talking of assumptions PowerShell assumes that with Get-ChildItem the first parameter is for the location, thus you don’t need to explicitly use the -path parameter in most Get-ChildItem scripts. Note 3: One of the main uses of PowerShell’s Get-Help is for researching -parameters for your task (Some people call them switches). In this case -recurse, -include and possibly -force are important modifiers for the Get-ChildItem cmdlet. Note 4: Whenever I call for Get-Help I append the -full parameter because I always like to peruse the built-in examples. Here is an example of a PowerShell script to mimic what you see in the Windows Explorer. One benefit of this particular script is that it drills down through all the sub-directories under "Program Files\". Note 5: Beginning a script with Clear-Host is my way of clear the screen of any previous output (just as cls does in DOS). The hash symbol # means a remark, or do not process this line. This command sets the variable $Dir to the path of the files that we seek. You have probably guessed the purpose of the -recurse switch, to drill down to the sub-folders. Get-childitem is often abbreviated to its alias, gci. $List is another variable whose purpose is to filter the output, as a result we get only executables. Pay close attention to the construction $_. which means, in this pipeline. 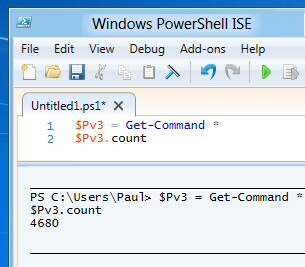 Also note that instead of the equals sign, PowerShell employs -eq. Note 8: PowerShell’s signature tune is the pipe symbol (|). Most PowerShell scripts contain at least one pipe to filter the output of the first command so that it becomes the input of the second clause. Note Out-GridView: Is a useful cmdlet to control data display. See more on how to pipe the results into out-GridView. 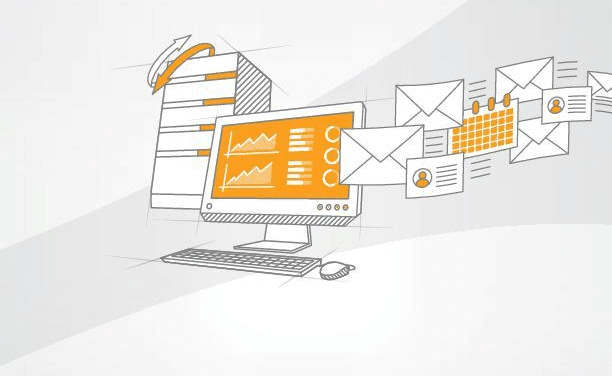 Note 9: Naturally you need to be logged on with an account which has the appropriate Exchange Server roles. See more ideas for Windows 8 PowerShell scripts. The way to get started is to Pin the ISE version to the Metro UI. 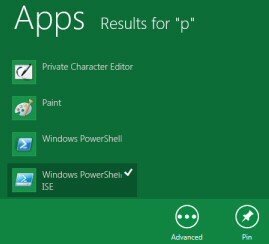 To do this just type ‘p’ and select Windows PowerShell ISE from the list of Apps. If you have experience of PowerShell then what’s new is more cmdlets, and more enticements for developers to use PowerShell to manage multiple servers.